Bijou - A gem of a little salon in Skaneateles: Bareminerals and Rareminerals, we've got them here at Bijou! Bareminerals and Rareminerals, we've got them here at Bijou! Bareminerals and Rareminerals are here in Skaneateles, at Bijou!! Come on in and try them out, we can get you anything you want! So I keep reading about this raremineral treatment. It's from Jurassic soil...I know that really interested my 10 year old and his friends!! We have it displayed on our large oval table and everyday, I look at it, I have put it on my hand a few times and kept meaning to try it, seemed to me that everything it promised..I needed!! On one small sidenote, I did find a really cool blog that reviewed all the baremineral products in a fun way! Check it out!! This girl is wicked cool! So I decided to give myself a challenge: Apply the Rareminerals every night before bed and see if I notice a difference after a month! Now my problems with my skin are typical, I have a "T" zone, oily on my nose and chin, but then super dry between my cheeks and nose...almost chapped dry. I have large (2 really large) pores on my nose and currently my skin has decided to pay me back for all that great skin I was fortunate enough to have as a teenager! I have little baby acne on my cheeks! So what I have to do is every night make tiny circles with my very soft little Rareminerals thingy and then go to bed!! I'll let ya know! The groundbreaking Bare Escentuals RareMinerals(TM) Skin Revival Treatment is the first and only clinically-proven mineral-based skincare treatment to deliver clearer, brighter, smoother-looking skin while you sleep. 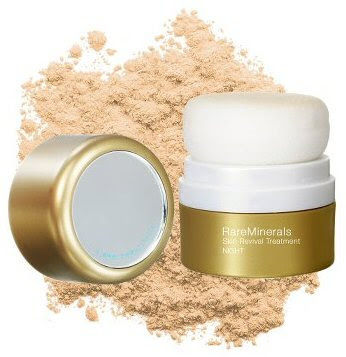 An exclusive blend of 100% pure RareMinerals(TM) derived from untouched virgin soil and in potent powder form, it's the perfect nutrient carrier for vitamins A and C and a host of botanical extracts.What it does:Naturally activated by your own skin, it effectively yet comfortably delivers benefits such as visibly-reduced lines and wrinkles, reduced sun damage, more refined pores, brighter complexion, softer, smoother texture, less noticeable redness, and clearer and firmer-looking skin. Containing no preservatives and zero irritants whatsoever, it's ideal for all skin types, including those with the most sensitive skin conditions, like rosacea. - Parabens- Sulfates- Synthetic Fragrances- Synthetic Dyes- Petro-Chemicals- PhthalatesWhat else you need to know:The Pillow Puff(TM) applicator provides flawless delivery and exact application, so you can infuse nutrients while diffusing imperfections.